The concept of miai is important in the fuseki as well. Playing situations that contain miai assure one of being able to achieve at least one of two aims regardless of how the opponent chooses to counter your strategy. In this common fuseki, Black chooses to play against White's position on the left instead of continuing to develop on the right, for example by forming a sanren sei by playing at a. When White answers with the common attachment at , Black plays the joseki of and and finishes with the high extension at . The modern popularity of instead of the alternative play at b is attributed to Takemiya Masaki and is based on a miai strategy. 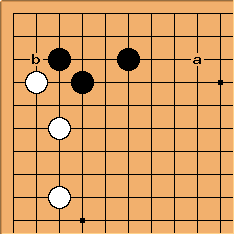 Black plays 7 in order to increase the value of a follow-up at c. Black then considers c and a on the right to be miai and is content to play whichever White does not take. White chooses to counter Black's intentions on the left so Black makes a sanrensei on the right side. To play like this Black must be willing and able to handle the White invasion at a. Here White decides to prevent a black formation on the right and splits the side with the wedge 1. As a result, Black is able to follow up on the right by approaching White's lower left corner at 2 and White will probably answer with something like 3. Note that White 1 is also a typical example of miai. The follow-up here is for Black to play against the white stone with either a or b and for White to reply with an extension in the direction away from the approach stone. Since both directions are open for White (are miai) there is no urgent play on the right side for Black at this time. The future course of the game may make one direction or the other more valuable. If that happens the miai situation disappears and the right side will become more urgent. The equivalence of the left and right side is much less clear here than in the examples on the miai page. There is no simple calculation this early in the fuseki to show that a play on the left and a play on the right have the same value. In professional play that equivalence has to be demonstrated over the board. In the fuseki above there are professional examples of White choosing both the left and the right with no clear advantage from either choice. For the moment, we can consider them miai (until someone comes along with an approach that demonstrates otherwise!). See miai in the fuseki statistical analysis for detailed discussion of that point. tderz Good that someone writes that (miai a<->c). 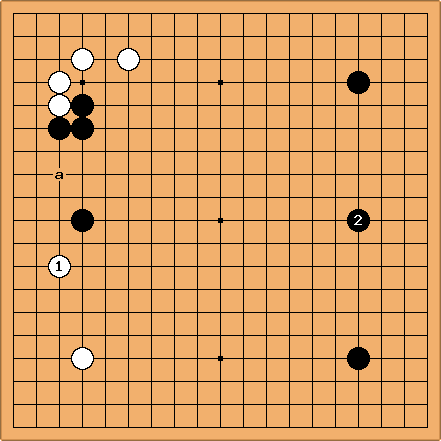 I saw this example in a Chinese book and got the impression that you have to play a in this position. 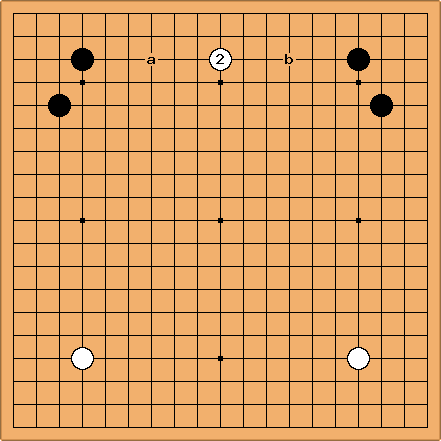 In this joseki, a and b are seen as miai to provide a secure base for the Black stones. After , a and b are miai in order to ensure a base for white on the upper side. (see wedge for more explanations).